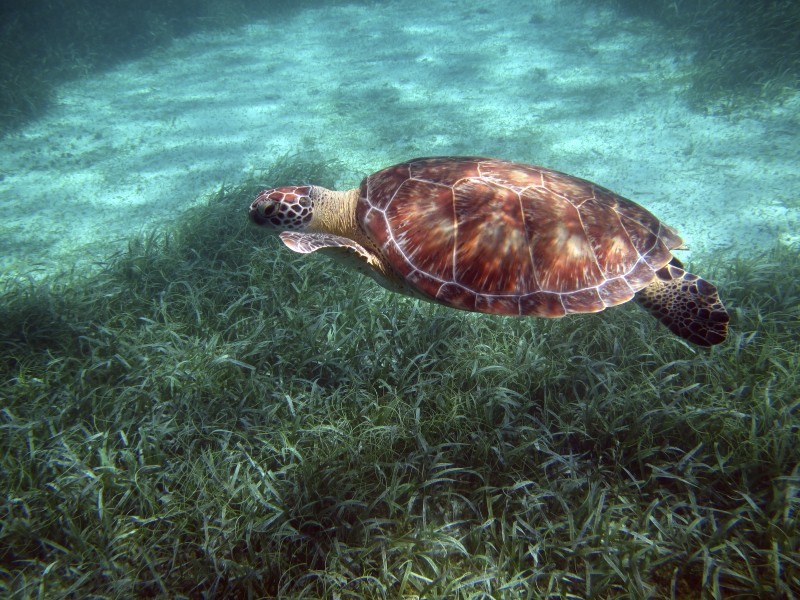 One activity of the Belize Turtle Watch Program is to document regularly sighted turtles and to use photo identification to determine their home range. Scientists use the scales on the side of turtle's heads to identify individuals that do not have obvious marks like a missing flipper or barnacles in older turtles. Please send us your photos so divers and snorkelers throughout Belize can work together to identify commonly sighted individuals! 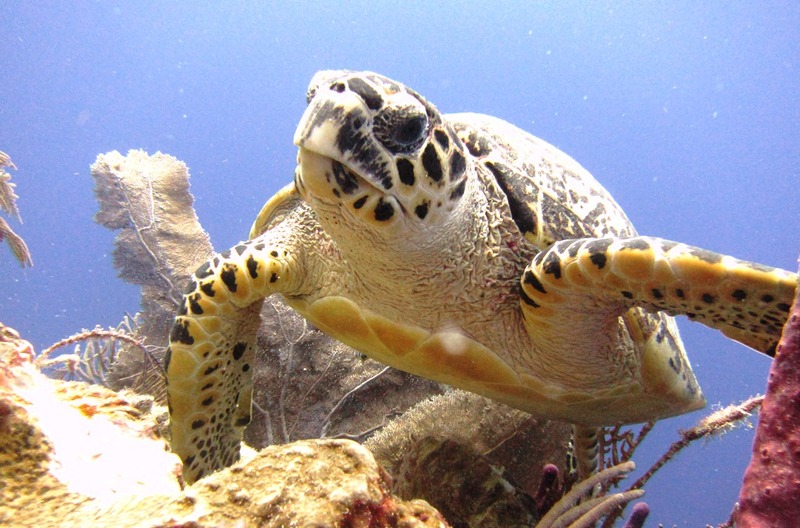 Using photographs to identify sea turtles has been done throughout their range. 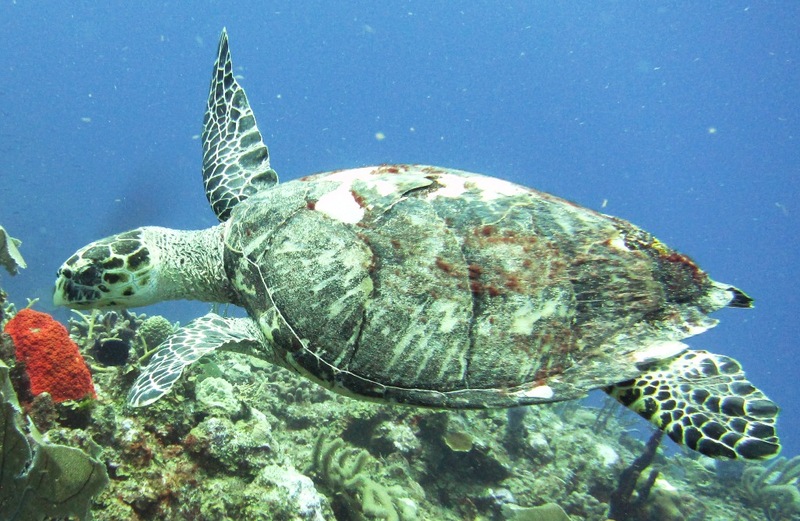 In Hawaii scale patterns on green turtles have been used to identify individual turtles. Leatherbacks are identified by the patterns of white spots on their soft shell. Hawksbills and loggerheads can be identified by the presence of large embedded barnacles in the carapace. 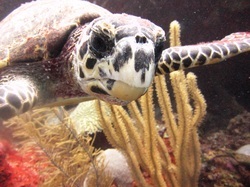 Some turtles can also be identified by missing flippers or pieces of the carapace edge from shark bite marks. When no obvious marks make it easy to identify individual turtles than patterns of color on their shell and beak can be compared. Photo collages of sea turtles are very useful for identification. For your easy reference please refer to the diagrams below for a sea turtle external anatomy used to described scutes and scales of sea turtles that are used in species identification. Please be sure to take and submit as many pictures as possible of turtles observed that will enable us find unique characteristics that can be used in identification. Please remember to never chase or grab turtles to take pictures. 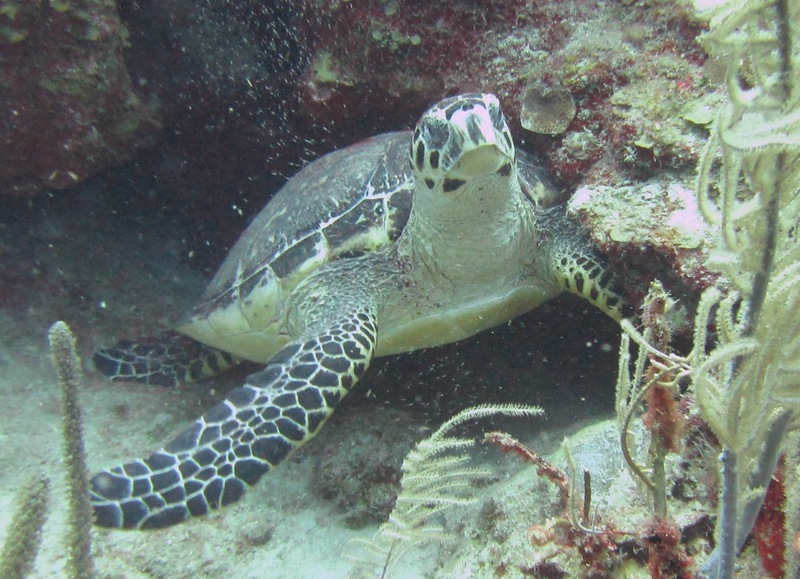 By using photo ID we aim to identify abundance and range of sea turtles that forage on our many popular dive and snorkel sites in Belize, so be sure and submit your pictures today! 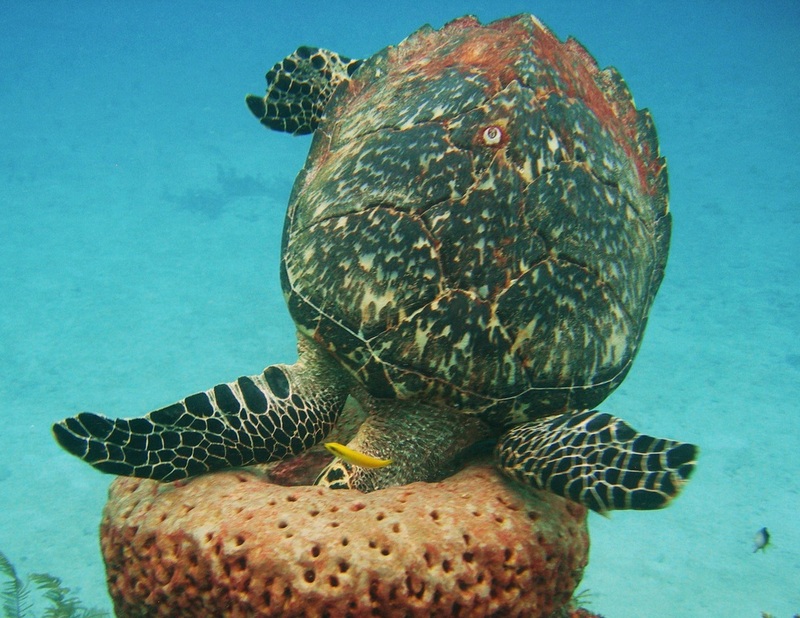 This hawksbill turtle was observed by Helene Hess on Ambergris Caye on July 24, 2011 at M&M dive site. We'll be looking to compare the blacking coloration in her beak to other turtles sighted in the area. 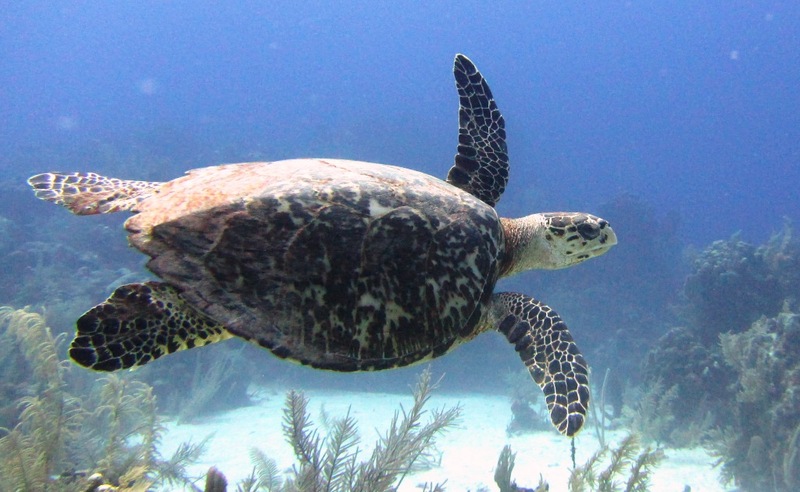 This hawksbill was observed off in the distance by Helene Hess on November 18, 2011 while diving off Ambergris Caye. Gordon Kirkwood observed this hawsbill turtle on August 14, 2011 at Tacklebox. This turtle has a large white spot on the 4th left lateral scute that can be used in identification. Let us know if you see her at another site! 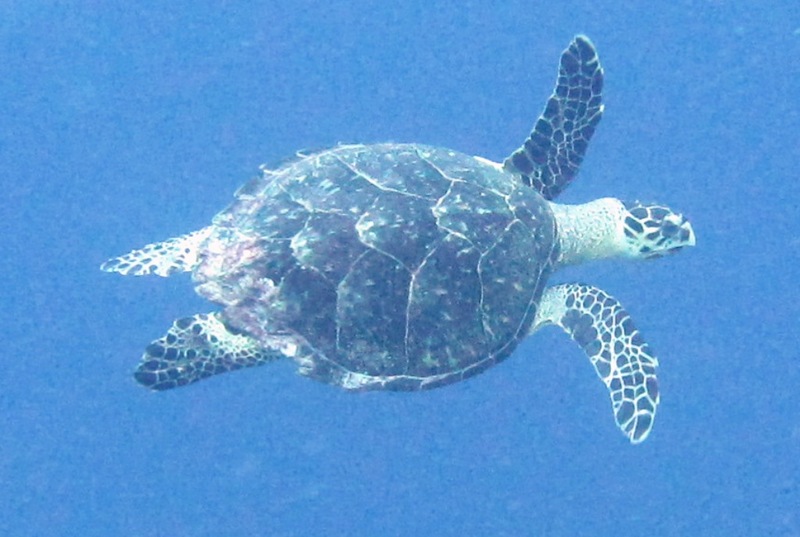 On February 3, 2012, Gordon Kirkwood saw this hawksbill turtle at Tres Cocos dive site in Hol Chan. 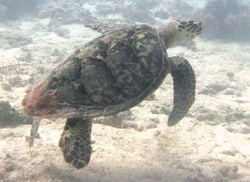 This green turtle was observed by Helen Hesse in Hol Chan on June 25, 2011. This turtle should be easy to identify since most likely she is one of the residents turtle at Hol Chan Marine Reserve. We will compare the scales on the side of her head to other pictures submitted of green turtles in the area. 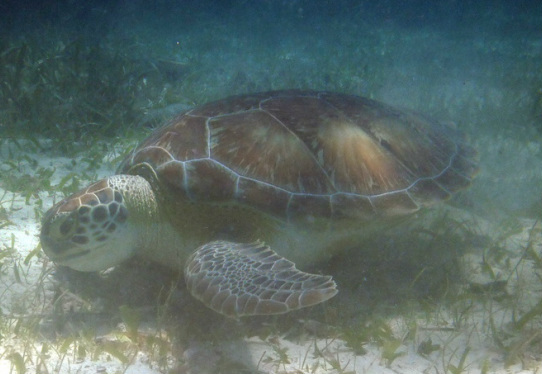 Another shot of the green turtle (same as turtle to the left) that Helene Hess Observed at Hol Chan on March 6, 2012. 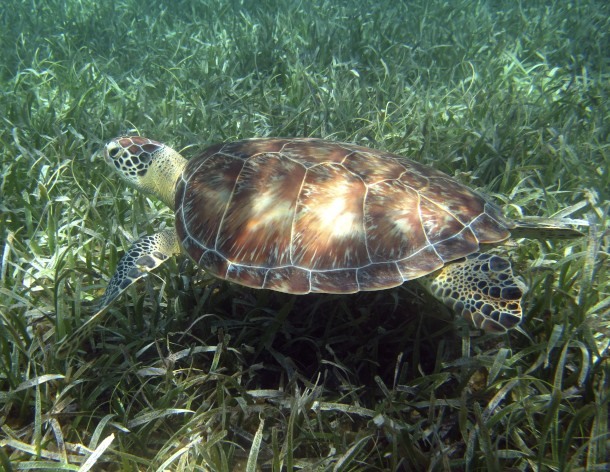 Another shot of the green turtle (same turtle as the photo to the left) spotted by Cheryl Bowen in Hol Chan on March 1, 2012. 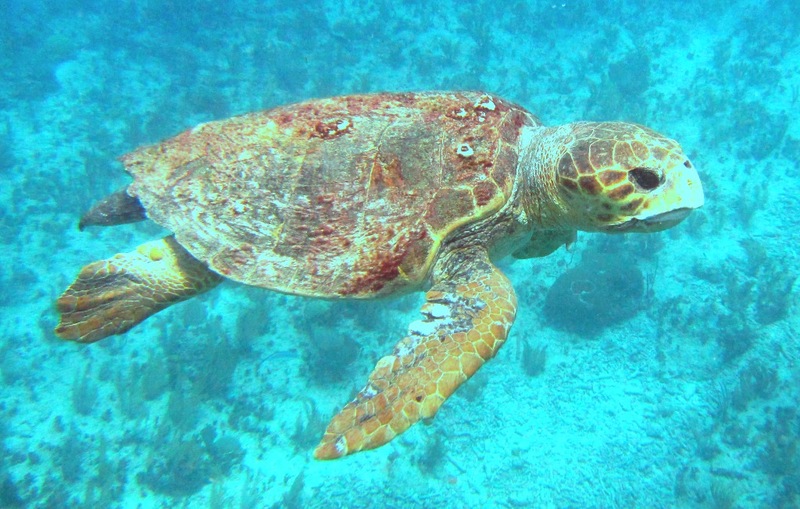 This loggerhead was observed by Helene Hess on August 5, 2010 by Ambergris Caye. This is a very old male loggerhead sea turtle with 3 barnacles on the right side if his carapace that we can use for identification. Adult male loggerheads are commonly reported in the spring time leading up to mating season, so this observation of one in August is interesting. On March 4, 2011, Gordon Kirkwood observed this loggerhead at Tacklebox in Hol Chan. These two loggerheads were observed by Priscilla Porter at a sight near Hol Chan where fisherman clean conchs. Unnatural feeding of marine life is never a good idea! 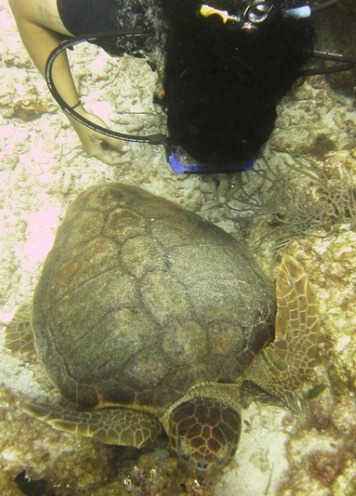 See how close the turtles get to the snorkelers? They are familiar with people and are likely to bite! Same as the loggerhead to the left. Large Male! The first confirmed observation of an olive ridley sea turtle occurred on Feb 4,2011 when a fishermen was reported to have come across discarded fishing gear in which this olive ridley turtle was trapped. After Olive was freed of the ropes she was not able to dive down and so was rehabilitated by the Hol Chan and Bacalar Chico Marine Reserves. In August Olive was fitted with a satellite transmitter and released. 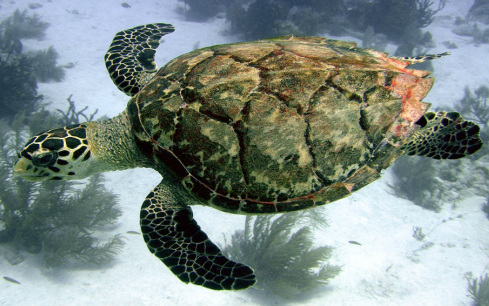 Her track took her north into important sea turtle feeding grounds in the Gulf of Mexico. Due to her entrapment in the discarded fishing gear she had deformities in her front flippers which can probably used in identification. 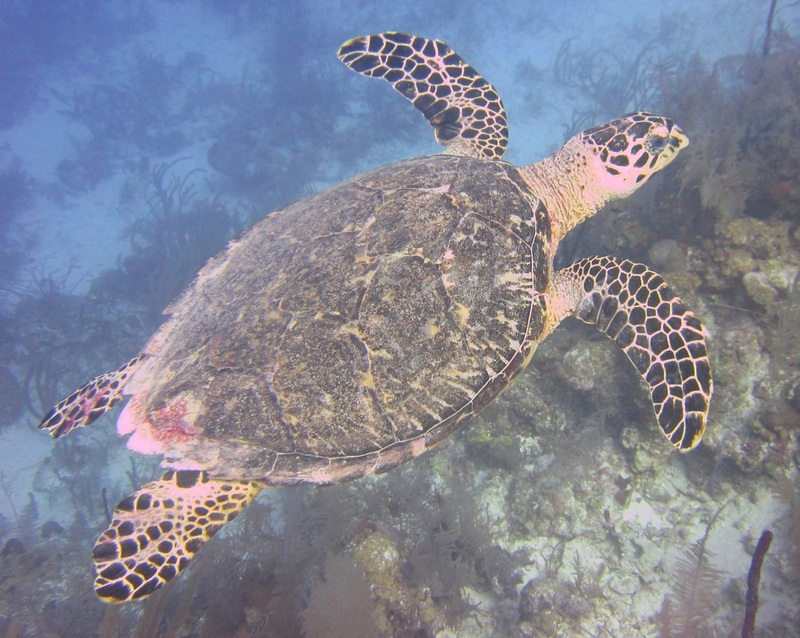 This hawksbill was observed at Sand Trap by Gordon Kirkwood on June 6, 2011 at Caye Chapel. 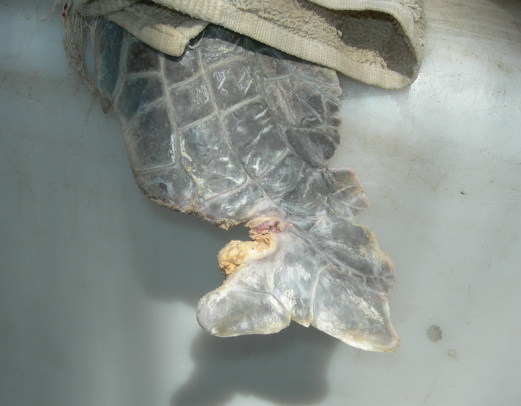 This loggerhead was observed by Gordon Kirkwood on June 6, 2011 while diving Sand Trap at Caye Chapel. Profile of right side of head shows thick black coloration on her beak. Profile of front of beak and left side of head has less black coloration. Turtle has one embedded barnacle on the 3rd central scute. This adult male hawskbill was observed by Gordon Kirkwood on Spanish Bay Wall on May 13, 2011. Large adult male observed on Feb 26, 2012 at the drop-off east of St. George's Caye. This loggerhead was about 4 ft in length and has patches of barnacles at the anterior end of this carapace that can be used for identification. 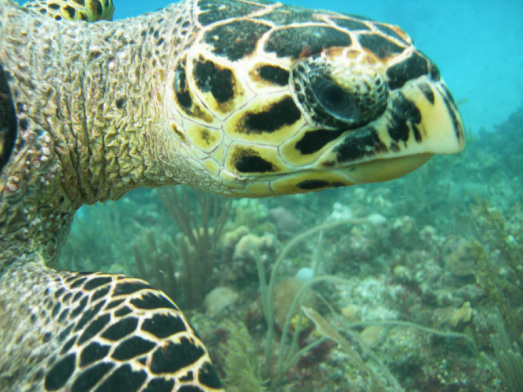 The beak of this hawksbill has three black spots on the left side of the beak that can be used for identification. 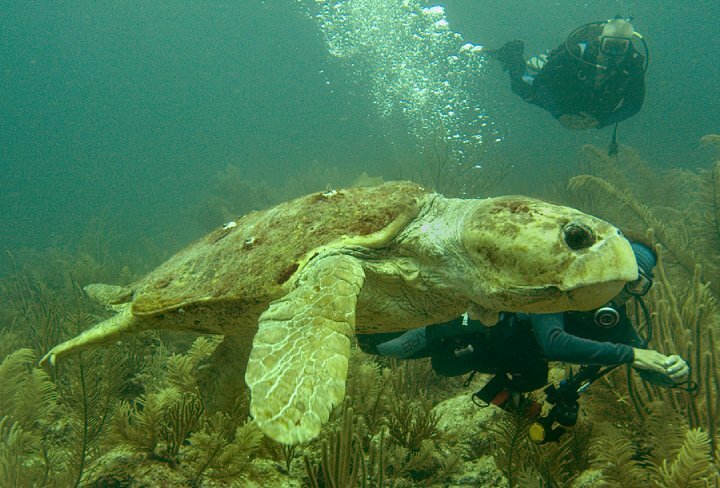 This big male loggerhead was sighted by Gordon Kirkwood at Rock Beauty dive site on April 15, 2012. 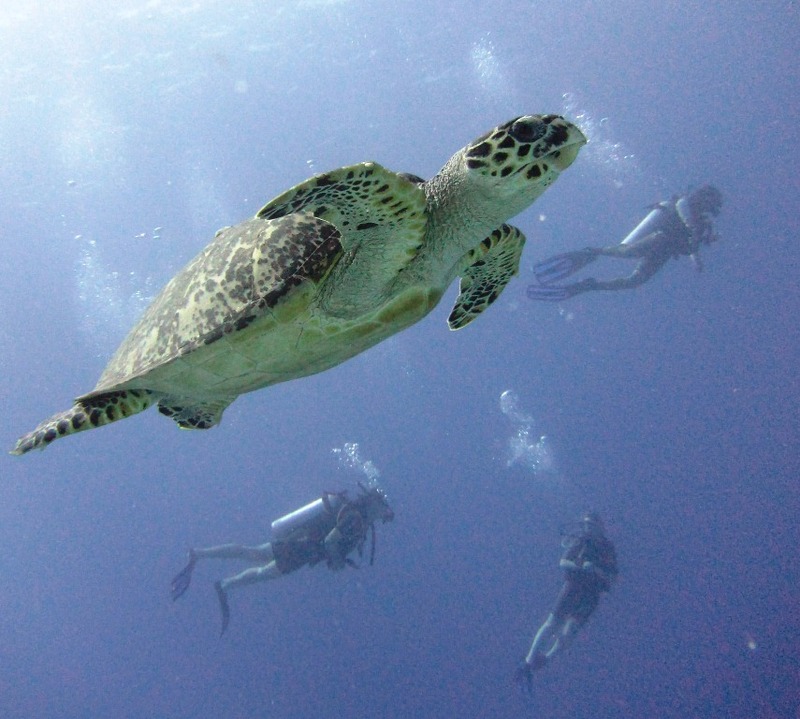 This hawksbill was observed by Gordon Kirkwood on September 9, 2011 at Aquarium dive site at Lighthouse Atoll. 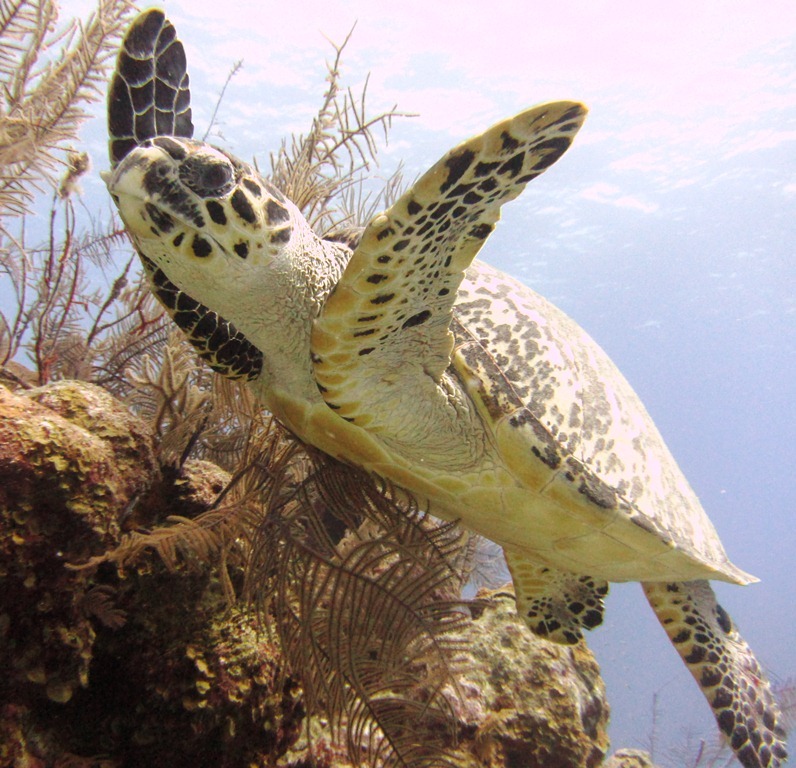 This hawksbill was observed by Gordon Kirkwood at the Blue Hole at Lighthouse Atoll on September 22, 2011. Another shot of the hawksbill seen on Halfmoon Caye Wall at Lighthouse Atoll on November 18, 2011 by Gordon Kirkwood! The same hawksbill as the photo to the left, this beauty was observed by Gordon Kirkwood on Halfmoon Caye Wall at Lighthouse Atoll. 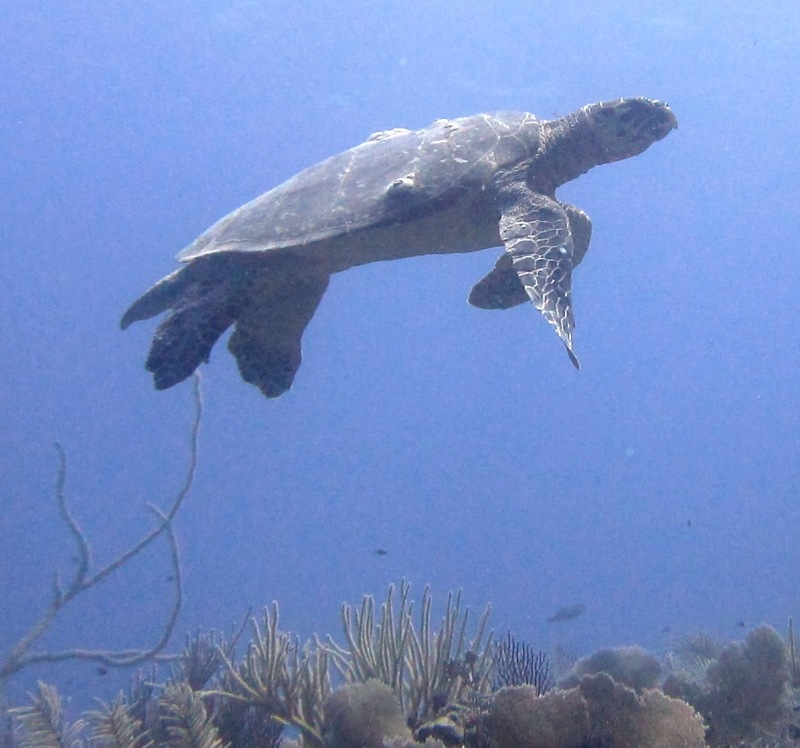 Same turtle as the other photo on Halfmoon Caye Wall on January 27, seen above. 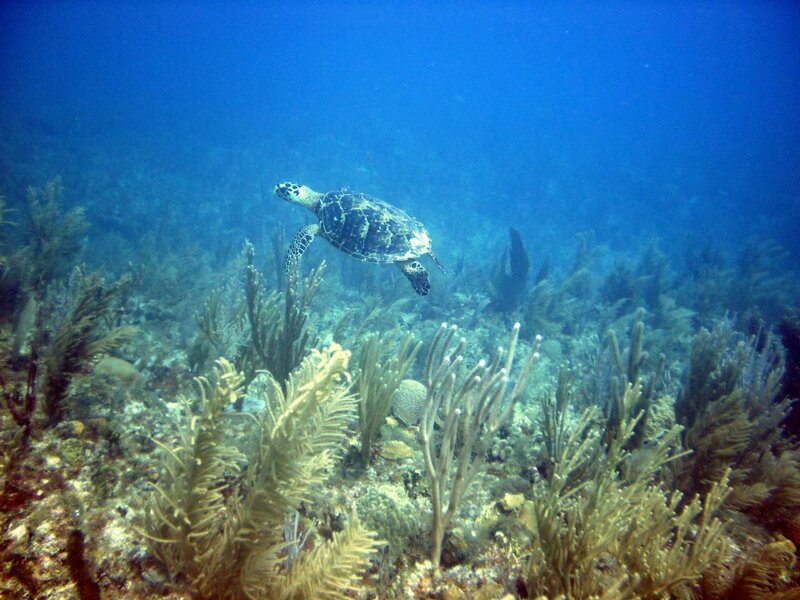 This turtle can also be identified as the same turtle sighted on November 18, 2011 on Halfmoon Caye Wall! It was identified by scales on the side of the head. 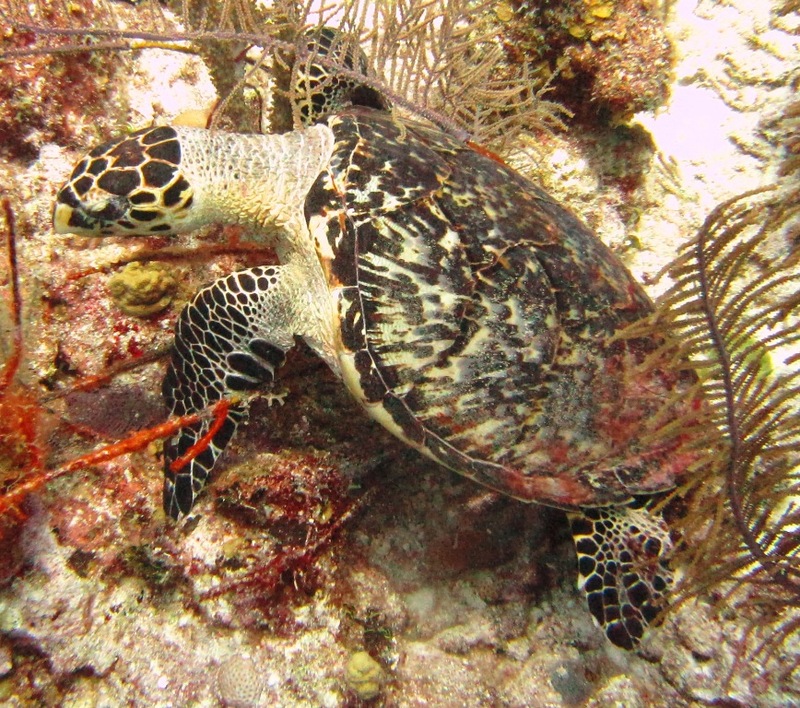 The first hawksbill Gordon Kirkwood saw on Halfmoon Caye Wall on February 24, 2012. 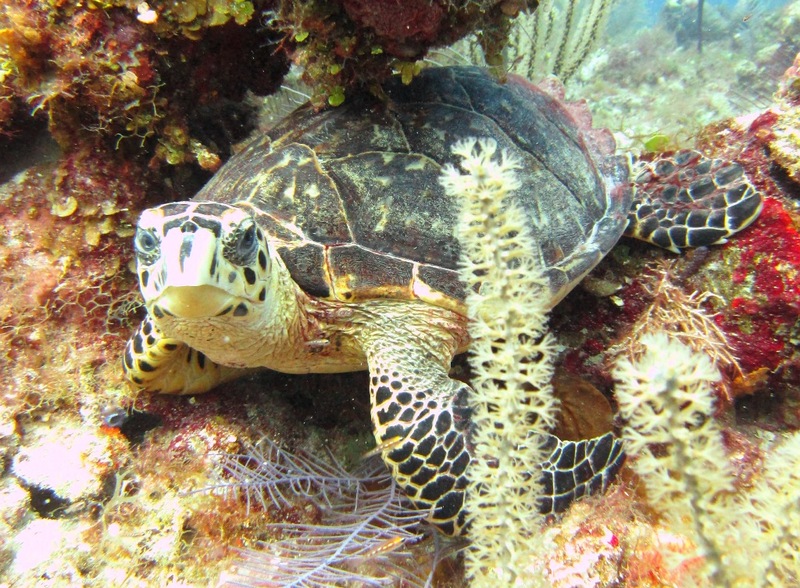 A second hawksbill Gordon Kirkwood saw on Halfmoon Caye Wall on February 24, 2012. Same turtle as seen in picture to the right! Please note the pale yellow plastron which identifies it as a green sea turtle. 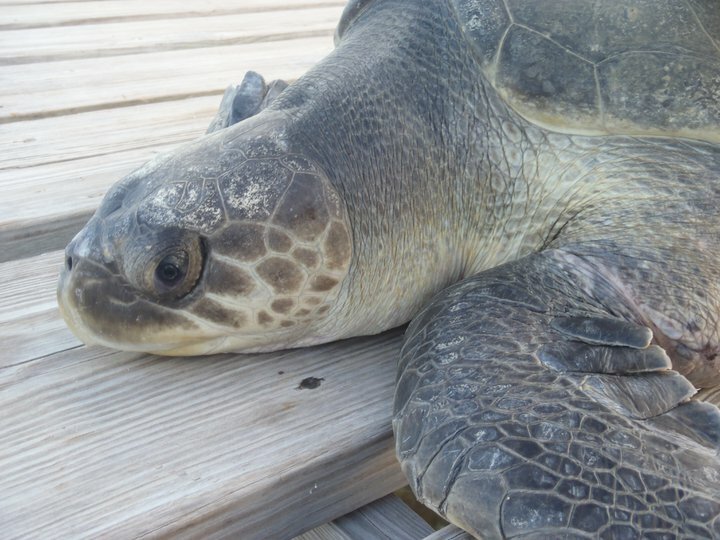 This loggerhead was observed at Hatchet Caye Resort on Hatchet Caye offshore Placencia on February 8, 2012. Male loggerhead sea turtle observed near Carrie Bow Caye. 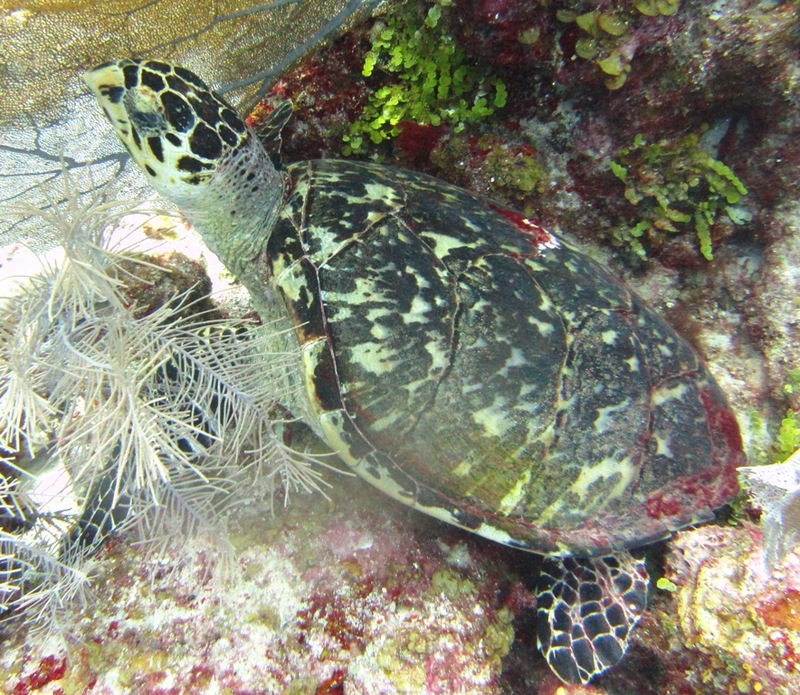 This hawksbill turtle was observed by Gordon Kirkwood on Long Caye Wall at South Glover's Atoll on June 6, 2011. 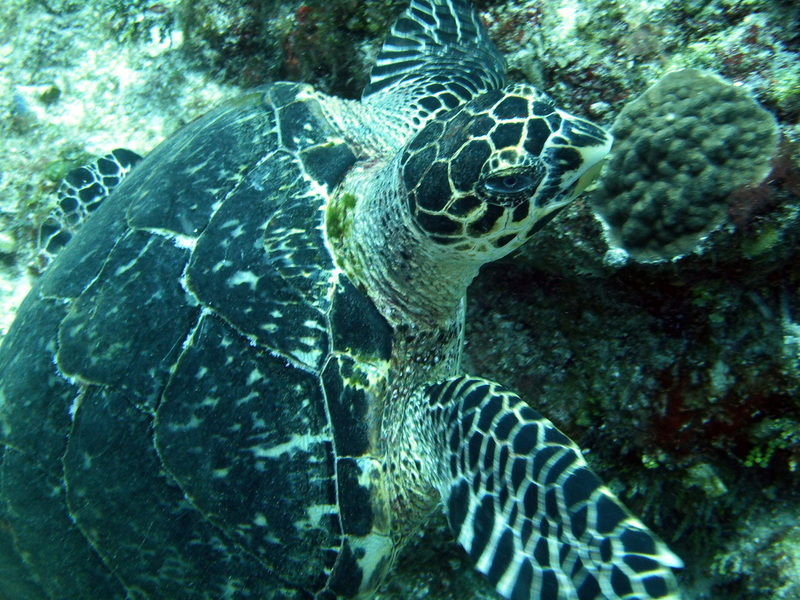 This hawksbill turtle was observed on October 18, 2011 by Gordon Kirkwood at South Glover's on Long Caye Wall. 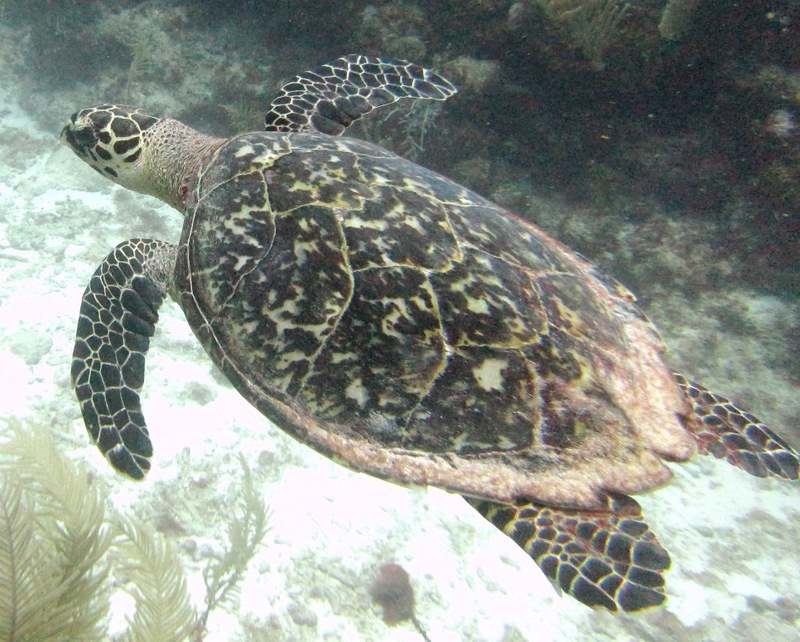 On October 18, 2011, this hawksbill turtle was observed on Southwest Caye Wall by Gordon Kirkwood on Glover's Atoll. Have pictures of turtles from Belize? 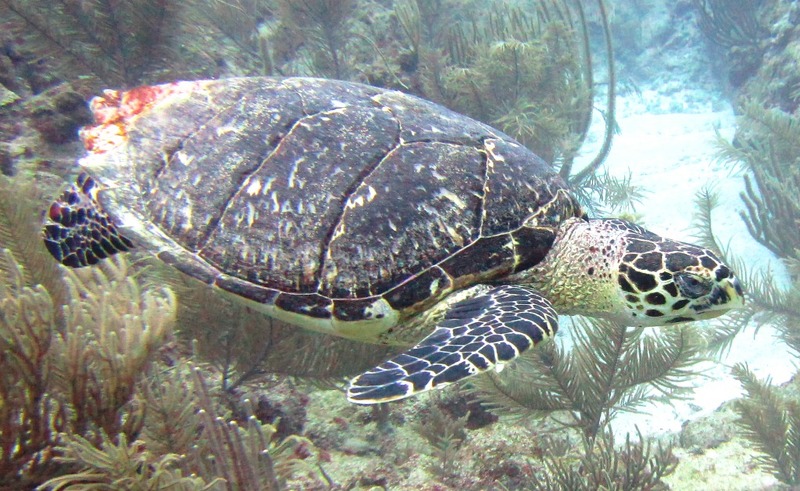 ​Please submit them today so our database on sea turtles in Belize grows even more!